« Anyone want veggie seeds? I’ve decided that i should start bragging about meals we make mostly with ingredients from the garden. This will hopefully challenge us to use more of our veggies in delicious home-cooked dishes- something we are surprisingly bad at, given all that we manage to produce on our little urban farm. So, this morning (is it still morning?) 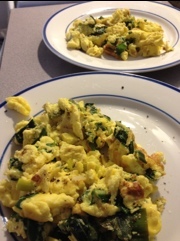 David made some excellent scrambled eggs from our chickens, plus thyme and a kale/cabbage cross from the garden. Leeks were from the store, but will soon be from the garden!